Only after the brewing process is complete is the alcohol removed, producing the distinct, crisp, clean taste you expect from Beck's bier, but without the alcohol. Beck's Blue is a light, crisp and refreshing non-alcoholic alternative to beer, with no compromise on taste. And, at only 53 calories per bottle and fat-free, it makes the perfect light refreshment. Beck's Blue goes through the same brewing process as traditional Beck's and contains the same four natural ingredients - barley, hops, yeast and water. 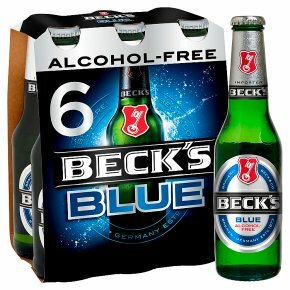 The only difference being that Beck's Blue undergoes de-alcoholisation, so it alcohol free. Golden in colour, Beck's Blue is a classic German-style pilsner lager with over 140 years of heritage. Originally brewed in Germany according to the Reinheitsgebot (German purity law).